This year’s Advanced Engineering was our busiest yet! 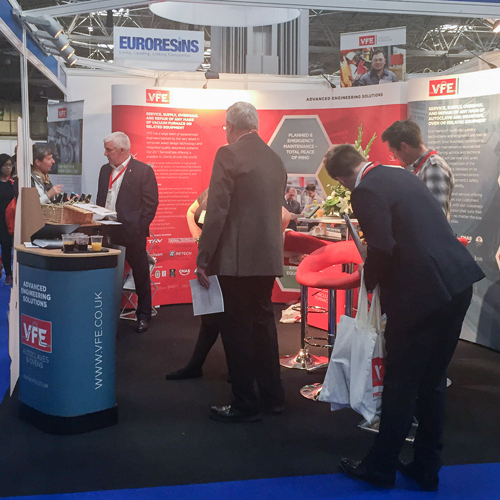 We were inundated with visitors to the stand wanting to find out more about our ServiceCare contract, maintenance and repairs service offering, and to meet Colin – the new face of VFE Pump Solutions. We gave away hundreds of our goody filled Colin – Top Dog for Servicing – mugs and spoke to loads of potential new customers and three lucky visitors to the stand won a case of Brew Dog beer. VFE Pump Solutions division is one of the market’s leading pump servicing providers, able to service and maintain almost any pump from any industry thanks to its team of expert engineers and specialist workshop. We deliver totally transparent service for complete peace of mind. Performance checks are videoed both before and after the service and supplied to the customer, so they can see, at a glance, what has been done. We will also provide a comprehensive report of works completed and advise on how to get the most from the pump in future. Our VFE ServiceCare contracts are available world wide and tailored to meet individual requirements, and cover equipment from vacuum furnaces to electron beam welding equipment and from autoclaves to any make or model of pump. Customers can build totally bespoke service packages by adding optional extras to the standard planned service and maintenance. Options include access to VFE’s technical helpline, 24 or 72 hour emergency response, 24/7 technical support, strategic spares and NADCAP/AMS 2750E TUS/Calibrations.